Researchers called it a “one-two punch.” Strong solar activity erupted while hurricanes surged through the Atlantic—coincidental events that have prompted researchers to look closer at the implications of space weather during emergencies. Scientists at NCEI are studying solar activity and tropical cyclones from the first week of September 2017, when overlapping events brought about severe consequences. Researchers want to expand the scientific and practical knowledge of solar impacts. In this case, bad timing increased the vulnerability of several Caribbean communities. [Hurricane season issues worsened by solar eruptions. The top left figure depicts the storm tracks of hurricanes Irma and Jose through the Caribbean. 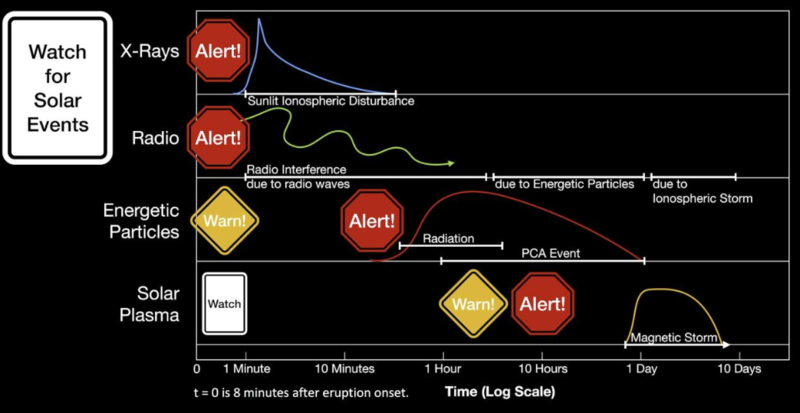 The bottom left figure provides an estimate of HF radio absorption due to the 6 September solar eruption X9.3 flare and SEP using the DRAP model. Hurricane Irma, a Category 5 storm, approached the Caribbean islands on September 4 and took its toll on several islands before passing about 60 miles north of Puerto Rico’s northern coastline on September 6–7. Ninety-three million miles away, activity on the sun set in motion another kind of impact. A solar active region, named AR12673, produced a series of solar flares that prompted multiple days of warnings from the Space Weather Prediction Center(SWPC) beginning September 4. Most notably, a significant X-class flare, measuring 9.3, erupted on September 6 as Irma bore down on Puerto Rico. The X9.3 flare, which triggered a major coronal mass ejection (CME), was the largest solar flare detected by satellites in about a decade and disrupted communication systems in its wake. As Puerto Rico endured the brunt of Irma, SWPC issued a radio blackout alert for the entire sunlit region of Earth. In the Caribbean, the subsequent radio blackout disrupted high-frequency ground communication and aviation systems when emergency needs were critical. An official for the Hurricane Watch Net (HWN) said the outage caused a near-total communication blackout for most of the morning and early afternoon of September 6. French Civil Aviation Authority officials reported losing contact with an aircraft in the region for 90 minutes during the blackout, triggering an alert. The hurricanes and the solar disruptions didn’t end with Irma. Hurricane Jose followed, and AR12673 remained active. In total, the active region fired off four X-class flares, the largest flare classification. Collectively, AR12673’s explosive events between September 4–10 were the most energetic of the current solar cycle, which started in December 2008 and is nearing its end. The events also elevated the risks of radiation exposure to astronauts, disruptions to space instrumentation, and long-term satellite damage. Hurricane Irma caused many fatalities and severe economic damage in the Caribbean and the United States. 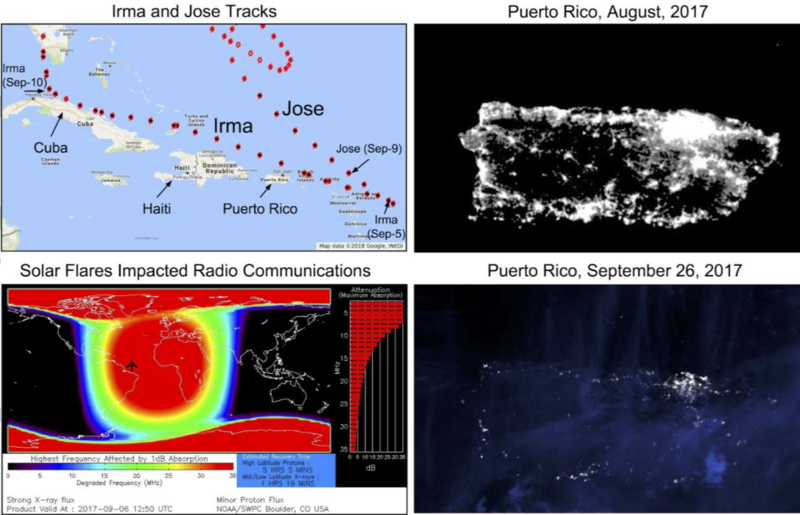 Space Weather has included the NCEI-led study in its special collection “Space Weather Events 4–10 September 2017.” Along with researchers at NCEI, the article “September 2017’s Geoeffective Space Weather and Impacts to Caribbean Radio Communication during Hurricane Response,” is coauthored by scientists with CIRES, NOAA’s SWPC, and the Joint Program in Oceanography and Applied Ocean Science and Engineering of MIT and Woods Hole Oceanographic Institute. The MIT author spent the summer of 2016 at NCEI as a NOAA Hollings Scholar; her contribution to this study used analysis techniques developed during her scholarship. Scientists anticipate additional technological consequences will be reported in the future. They suggest that improving the operational availability of real-time coronagraphic imagery for future large flares will help forecasters analyze, model, and issue timely geomagnetic warnings. The authors found the series of solar events to have significant potential for additional study.